WTF Are You Reading? 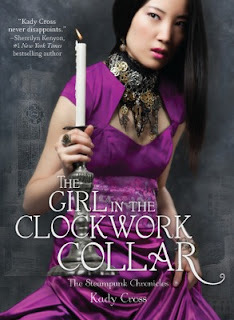 : You'll Get Hung Up on the "Girl In the Clockwork Collar"
You'll Get Hung Up on the "Girl In the Clockwork Collar"
Just when I thought that Kady Cross couldn't get any better. I was lucky enough to get the chance to read the ARC of "The Girl in the Clockwork Collar", and be proven wrong...wrong ...oh so delightfully wrong. Jasper was a character that was not discussed in the review for "The Girl in the Steel Corset" because in that book, he was merely eye-candy and a less than effective third for a love triangle of sorts for Emily + Sam. This book is ALL about Jasper and proves that he is able to more than hold his own story-wise with Finley, Griffin and the gang. Mr. Reno Dalton, who unlike Jack Dandy, who again, was not mentioned in the first review for lack of literary relevance beyond that of irritating third for Finley + Griffin and eye candy is truly wicked. In Dalton, readers are presented will real menace. He has some very evil plans that he is not beyond kidnapping, extortion, and even murder to achieve. Yes, I did say baddies. That was not a typo. There are a few "unexpected" snakes in the steampunk garden, so tread lightly dearest reader. There is romance in this book. Bear in mind however, that though this book may be full of corsets; there will be no bodice ripping or heaving bosoms here. Instead you will find the first blush of "budding love". The rekindling of past fires. The continuation of realized love and betrayal and love lost. This book proves no slouch in the tech department and this time the mechanical goodness comes courtesy of one Nikola Tesla. It is so nice to see Emily interact with the great man and his "jaw dropping" genius. It all takes place in America!!!!!!! This book is so much fun, has so many plot twists and so much action that you can't help loving it from start to finish. I really enjoyed the first book but LOVED this one! The characters were absolutely fantastic and I loved the steampunk elements, of course!